Smooth and creamy smoked salmon dip has all the flavor of smoked salmon with hints of lemon, dill, and capers. Great to spread on bagels or dip with crackers. Smoked salmon is one of those delicacies that are hard to get enough of. But, of course, that’s exactly why smoked salmon dip is so awesome. Because with just a little help from some creamy cheeses and a few dashes of lemon, dill, and capers, you can stretch the delicious flavor of smoked salmon to a whole bowl. And, let me tell you, there are plenty of ways to enjoy this dip. Whether you use it as a sauce, garnish, or a spread, it’s the perfect indulgence for partying or snacking. Can you eat smoked salmon dip while pregnant? Bad news here, folks. Pregnant women should not eat refrigerated smoked seafood, and the smoked salmon in this recipe falls under that category. The only exceptions to this rule are if the fish are cooked and served warm, and they won’t be in the case of this chilled dip. So if you plan to serve this dip at a party or event, check to see if there will be any expectant mothers present. You can always serve a different party dip instead. Can you make smoked salmon dip ahead of time? Yes! For the best taste and flavor, this dip can be made one day ahead of time and stored in the refrigerator until ready to eat. If you’re using hot smoked salmon (that’s been chilled), the dip should last for five to seven days. If you’re using cold smoked salmon, the dip should be eaten within one to two days. Can you freeze smoked salmon dip? Due to the mayonnaise and sour cream in this dip, freezing is not recommended. These ingredients tend to break down during freezing and thawing, so while the dip still might taste the same, the texture may change from creamy to chunky or gritty. As mentioned above, you can use either hot smoked salmon (that’s chilled) or cold smoked salmon for this recipe. Salmon that’s prepared this way is very soft and great for blending in this dip. Do not use raw salmon. Traditionally cooked salmon (that’s firm to the touch) can be used, but it’s not ideal and may have the same creamy texture. 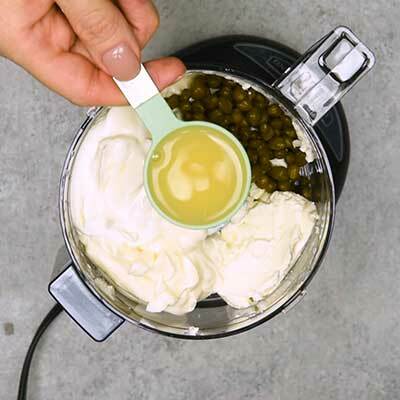 Step 1 – In a food processor, blend the cream cheese, sour cream, mayonnaise, capers, lemon juice, and Worcestershire sauce until smooth. I typically watch the cream cheese and make sure it’s broken down before moving on to the next step. 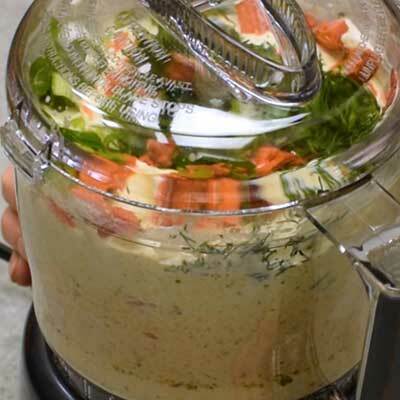 Step 2 – Add the salmon, dill, and onion to the food processor, then season with salt and pepper to taste. 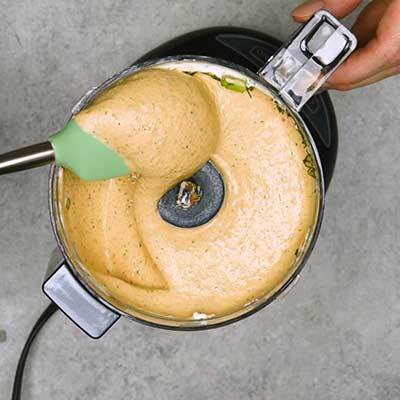 Blend again until no pieces of salmon are visible and the dip has an ultra creamy texture. Step 3 – Serve immediately with crackers or bread for dipping! 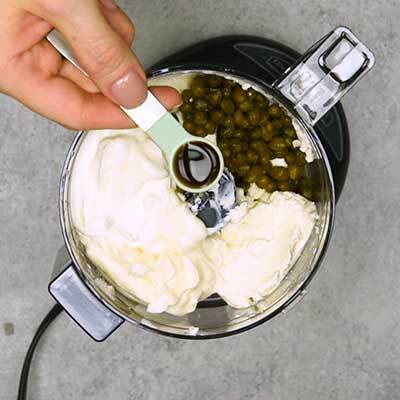 In a food processor, add cream cheese, sour cream, mayonnaise, capers, lemon juice, and Worcestershire sauce. Pulse or blend until cream cheese has broken down, about 3 to 5 minutes. Turn off the processor and add salmon, dill, onion, and salt and pepper to taste. Pulse or blend again until salmon is thoroughly chopped and mixture has a smooth texture, about 5 to 7 minutes. Taste test dip; season with more salt and pepper, if necessary. Serve dip immediately with crackers or bagels for dipping with more fresh dill as garnish. If you'd like the dip to be firmer, chill in the refrigerator for 30 to 60 minutes, then serve.